A standalone in the Drakoryans series that looks at a character introduced in Fire Bride. 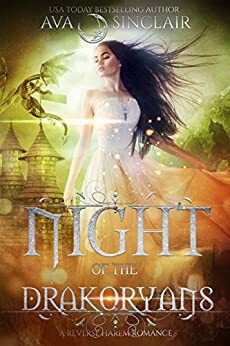 Night of the Drakoryans by Ava Sinclair happens before Lyla is taken by her dragons by a few years. Syrene was happy to be picked. She looked forward to dying and not having to live her previous life. But when she thinks that she has been robbed of her own death she decides to take it on the first person that she see. Edrys thought that their new bride would be happy to get to become a lady of their manner. Little did they know the abuse that Syrene went through at the hands of her step mother and her weak father. Syrene fights Edyrs upon waking up, prompting a discourse between he and his two brothers Xarsi and Nyron. The two find out from their oracle about her horrid past. The witches grant the brothers an extended night in order to woo Syrene or else their line will die out. Syrene has to learn how to live her life without the constant harassment from her step mother and the rest of her village. Can Syrene come to terms with not only liking herself but also learning to love and be intimate with three Dragon Lords? I enjoyed Syrene in Fire Brides so was excited to read her story. She is so strong willed and it came across well in Fire Bride so getting to read her complicated past adds to who she is. The story like the others in the series are written from each characters points of view. I always enjoy that when I read. It is a great way to have a reverse harem without it being the typical as it always happens with all of the Drakoryans. The writing is well done and though it is shorter than the others in the series, since this is standalone it works well. I hope that Syrene appears in the next Drakoryans novel. Check out the Night of the Drakoryans here. Read Sacrifice here and check out my review. Read Fire Brides here and check out my review here.